Robertson Lamb Hut after BBQ meet. 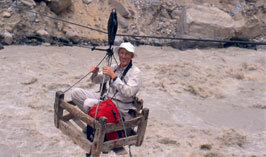 Crossing the Braldu River at Jola near the snout of the Baltoro Glacier. "Rule 1. NAME AND OBJECTS. The Club shall be called the The Wayfarers' Club and its objects shall be to encourage the pursuits of mountaineering, walking, ski-running and cave exploration, to bring together men and women who are interested in these pursuits and to do whatever shall be deemed by the Committee from time to time to be conducive to the attainment of the foregoing objects." These have been the objects of the Club since it was founded in 1906 in Liverpool, and continue to be so today. 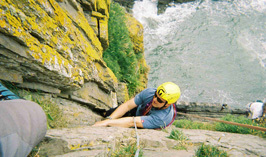 The Wayfarers' Club is a national club with strong base of members from Merseyside and the Northwest. In 2018 we finally achieved the necessary 75% voting majority to allow women to apply for membership. To pursue the Clubs' objects, the Wayfarers have regular organised meets around the UK, often in our own hut and those of our kindred clubs. Informal parties are frequently in action at home and abroad. The Wayfarers also have a deserved reputation for their social activities. These include the Annual dinner and BBQ; our catered meets have become something of a speciality. In the century of the existence of the Club, Wayfarers have left footprints in every continent and countless countries. 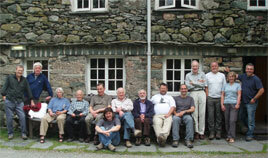 In recent years, members' activities have ranged from homely rambles up Langdale to the ascent of Everest.